Once again, the hours of the day have flown by me. In order to illustrate this point I am going to feature some beautiful antique timepieces from the 16th century, the first century of watchmaking. The first watches originated in 16th century Germany. A hundred years earlier clockmakers had invented the mainspring movement, and by the 1500s, there were clocksmiths with sufficient skill to miniaturize this apparatus into miniaturized timepieces meant to be worn. This first generation of “watches” were really more like pendant clocks meant to be worn (how much else does Flava Flav owe to reformation-era Germany?). These pendant watches only had an hour hand (often behind a heavy lid of glass or crystal). They needed to be wound twice a day and they were not very reliable (sometimes losing multiple hours in a single day), however they became popular with the aristocracy because of the eternal love of novel cutting-edge technology and because they were human-made portable accessories which moved on their own—a wonder in that age. The first generation of watches were heavy and ostentatious—more like mechanical jewelry than modern chronographs. The disk shape familiar in personal timepieces for the last half millennium was not yet standard (or even achievable) and so all sorts of novelty shapes prevailed. Thus the first generation of watches featured all sorts of gilded ticking eggs, books, astronomical bodies, animals, fruit, flowers, insects (look at that crowned queen bee watch! ), body parts, and religious symbols. These are a bit strange to modern eyes but they are also refreshing in our age of ubiquitous sleek black tablets. I suppose these are really the great great great grandparents of all of the personal devices which define this era. Yet looking at the strange clunky shapes of these precious odd mechanical survivors is refreshing too. Imagine if your mechanical death’s head was off by several hours and didn’t beep intrusive emails at you all day! One theory of aesthetics asserts that every human-manufactured item provides profound insights into its makers and their society. In college, we had endless fun (or some reasonably proximate substitute) by grabbing random kitschy mass-produced objects and deconstructing them so that all of the peccadillos of wage-capitalism in a mature democracy were starkly revealed. Alone among college endeavors, this proved useful later on, when I worked at the National Museum of American History (where the staff was employed to do more-or-less the same thing). Seemingly any item could provide a window for real understanding of an era. Thus different aspects of our national character were represented by all sorts of objects: harpoons, sequined boots made in a mental asylum, an old lunch-counter, gilded teacups, or miniature ploughs…even a can of Green Giant asparagus from the 70s [btw, that asparagus caused us real trouble and was a continuing problem for the Smithsonian collection: but we will talk about that later on in an asparagus-themed post]. The objects which were significant were always changing and things regarded as treasures in one era were often relegated to the back of off-site storage facility by curators of the seceding generation, but a shrewd observer could garner a surprisingly deep understanding of society by thinking intelligently about even apparently frivolous or trivial objects. Anyway, all of this is roundabout way of explaining that Ferrebeekeeper is celebrating the Day of the Dead by deconstructing these two skull-themed items. At the top is a skull-shaped candle holder with a bee on it. At the bottom is a skull shaped lotion-dispenser. One dispenses light while celebrating the eusocial insects at the heart of agriculture; the other dispenses unguents and celebrates the reproductive organs of plants. But of course, when we look at these items more closely, there is more to them than just a decorated lamp and a cosmetics container. The Día de Muertos skull already represents a syncretic blend of two very opposite cultures: the death-obsessed culture of the Aztecs who built an empire of slavery and sacrifice to make up for dwindling resources at the center of their realm, and the death-obsessed culture of the Spaniards who built an empire of slavery and sacrifice to make up for dwindling resources at the center of their realm. Um…those two civilizations sounded kind of similar in that last sentence, but, trust me, they were from different sides of an ocean and had very different torture-based religions. Lately though, things have started to rapidly change. Although agriculture is the “primary” economic sector which allows all of the other disciplines, most of us no longer work in the fields. Instead we partake of secondary sector work: manufacturing things. In this era we are even more likely to be in the third (or fourth) sector: selling plastic skulls to each other, or writing pointless circular essays about knickknacks. Marketers have inadvertently built additional poignant juxtapositions into these two skull ornaments. The skull at the bottom is a lotion or soap dispenser. It is meant to squirt out emollients so that people can stay clean and young and supple in a world where old age still has no remedy. 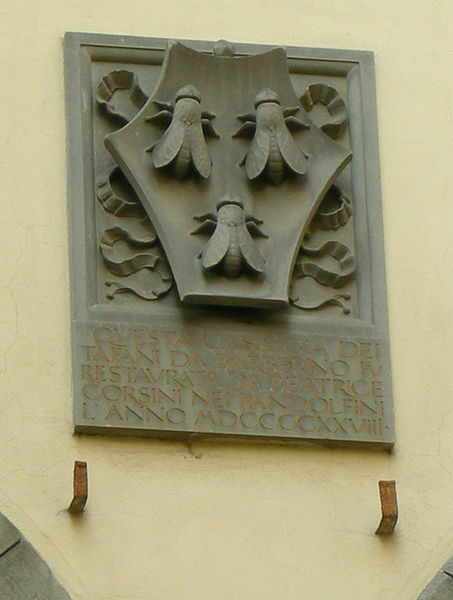 The irony is even more sad in the skull on the top which shows a busy bee: the classical symbol of hard work paying off. Yet the bees are dying away victims to the insecticides we use to keep our crops bountiful. Hardwork has no reward in a world where vast monopolistic forces set prices and machines churn out endless throw-away goods. Indeed, these two objects are not beautiful folk objects…they are mass-produced gewgaws meant to be bought up and thrown away. In the museum of the future will they sit on a shelf with a little note about bees or lotion or crops written next to them, or will they join a vast plastic underworld in a landfill somewhere? Or maybe they are just endearing skulls and you aren’t supposed to think about them too much. But if a skull does not make the observer think, then what object ever will? Today’s post comes from the thrilling (?) world of international football aka soccer [Ed. Are you sure this is right?] 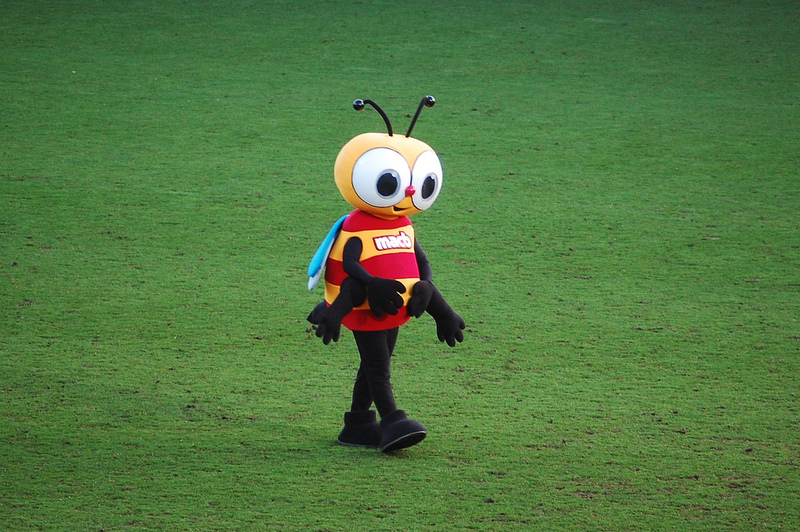 Although, to American eyes, soccer sometimes seems to lack critical elements of sport (excitement, skill, scoring, and so forth), it definitely has the most important thing: wacky mascots! 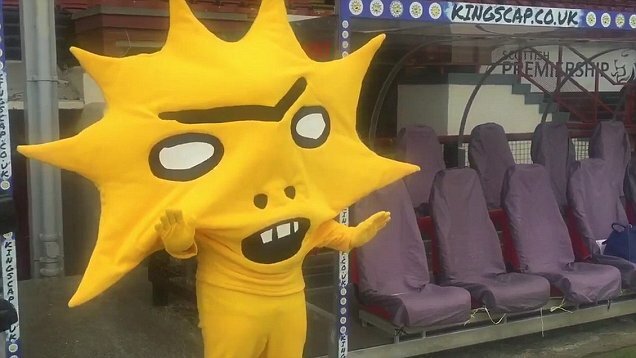 In fact, soccer arguably has the wackiest mascots, as is very emphatically demonstrated by the new mascot of the Scottish football team Partick Thistle (er, that’s apparently the name of their soccer club, not the new spokesbeing). Apparently the old mascot, Jaggy MacBee, (pictured above) was not edgy enough for something as riot-inducing as Scottish football. Fortunately, the new mascot, pictured below in all of his (its?) stark raging horror is nothing but edges! 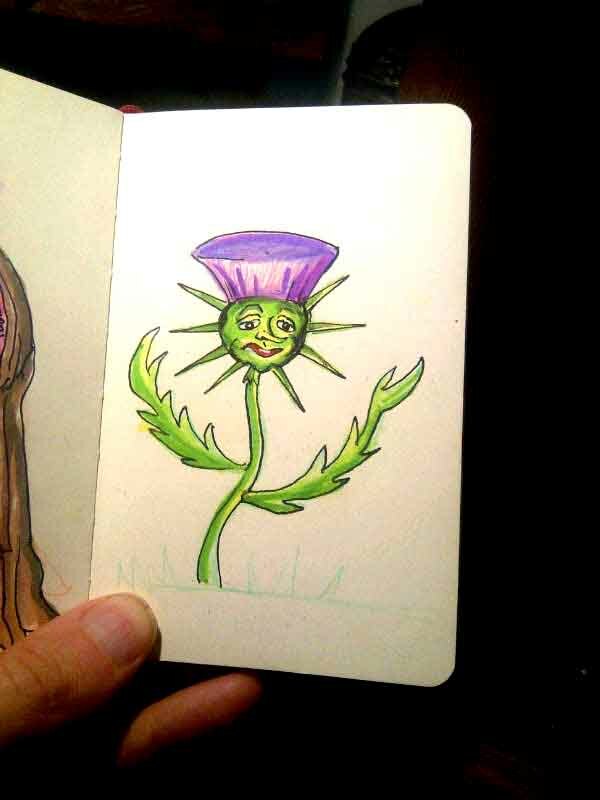 Well, that isn’t entirely true, “Kingsley” the yellow thistle also has a mouth-breathing look of angry stupor and a unibrow to go with his (its?) sharpened head. 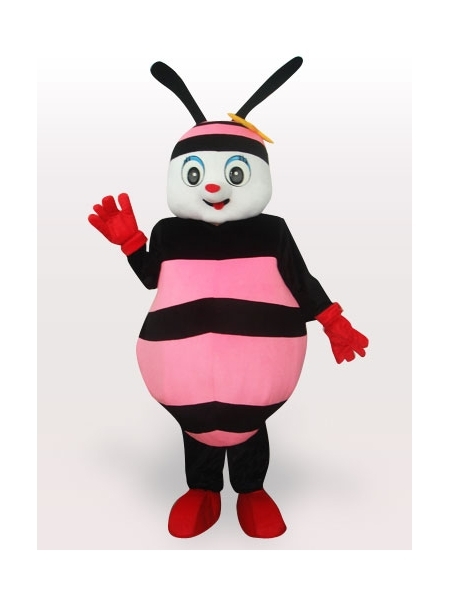 The internet has been abuzz with sarcastic quips about the ambulatory thistle and with wistful nostalgia for the unemployed bee (as indeed was almost certainly the intent of some sinister group of marketers behind the entire switch). Even despite the transparently manipulative nature of the upgrade, there really is something poignant about the substitution. Bees are fading from our pesticide-heavy world (as we will discuss in a real post tomorrow) while irritating characters specifically and solely designed to create an angry emotional response are proliferating. Also, Kingsley is not unfunny. He has his own particular Alfred Jarry flavor, as was the intent of the responsible artist David Shrigley, who designs deliberately crude cartoons to mock the shirking anomie of contemporary mass culture (at least that’s how I am going to interpret them). 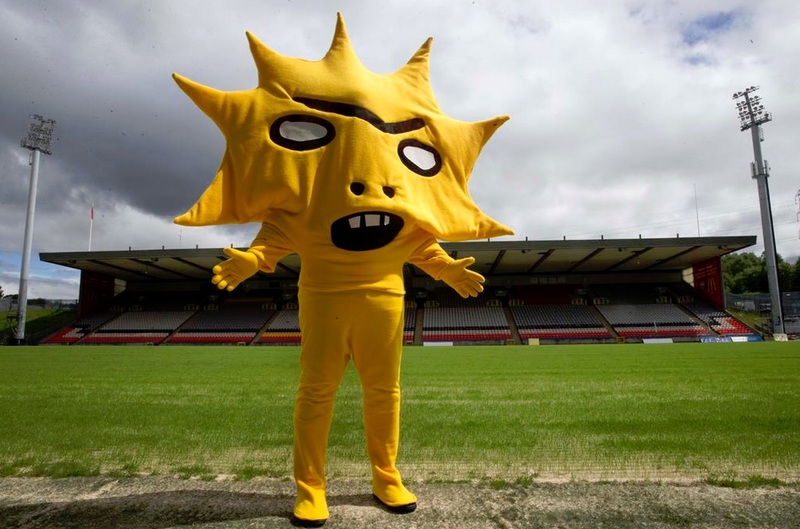 How would you design a thistle mascot? It is not necessarily an easy challenge, although I know my submission would have been more purple and baroque—like everything I make. Stay tuned for the further adventures of Kingsley and Jaggy MacBee. I get the sense we haven’t heard the last of these guys—if for no other reason than the obtrusive attention-seeking of their makers. Today we are featuring a small painting by a contemporary painter, Mark Ryden (whose work has showed up on this blog before). 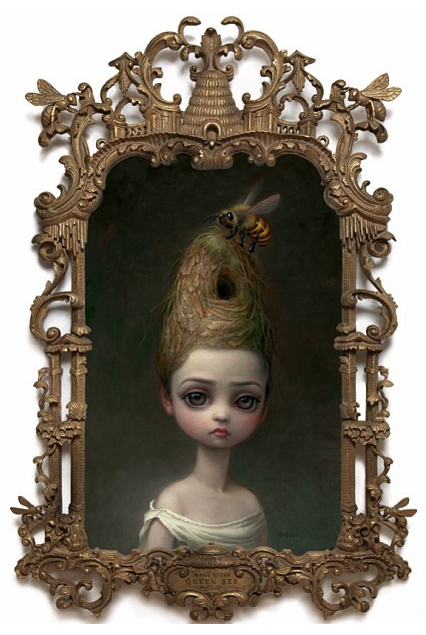 This is “Queen Bee” a portrait which stands somewhat in contrast with Ryden’s usual style: although the painting does have the jewel-like illustration quality which constitutes half of his trademark; it notably lacks the dark narrative extravagance of earlier works. The best of Ryden’s oeuvre has the feel of a fairytale which has fallen through a dark hole in the world. “Queen Bee” is more elegiac. The emotionally empty pouting expression on the figure’s doll-like face works as a receptacle for whatever emotion the viewer wishes to project into it. The glorious golden bee who is desperately assembling a hive from hair, grass, and leaves is the true subject of the work. Of course a single honey bee is an anomaly and a failure—honey bees are social organisms which can only survive and flourish as a hive. So the viewer is left to draw her own conclusions about the thematic meaning of the piece. 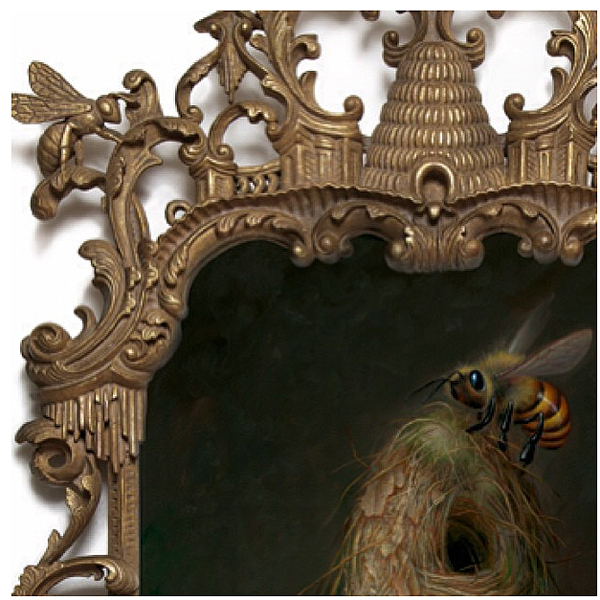 Although Ryden paints his own paintings (unlike many artworld superstars who leave lowly creative tasks to underpaid interns, apprentices, and assistants), he does hire Asian artisans to build the remarkable frames to spec. Look at how lovely the gilded hive is! 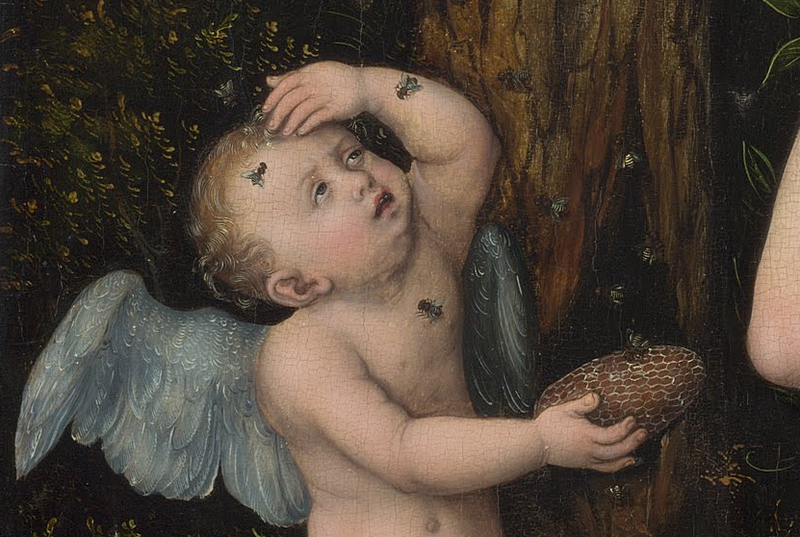 Are these bees in the frame the real workers for the bee in the painting? There might be a subtle sting for the entire concept of fine art buried in that question. This particular painting was made for charity. Ryden auctioned the piece off in the spring of last year and donated the proceeds to the World Wildlife Fund. While the piece did not fetch the princely multi-million dollar price associated with works by annointed art world insiders, you could certainly buy several houses in West Virginia with the proceeds. It is very good of Ryden to give to such a meaningful cause. One of these days, I’ll have to host a charity auction of my own paintings for the world’s endangered animals (sometime on down the road when I am not one of them). 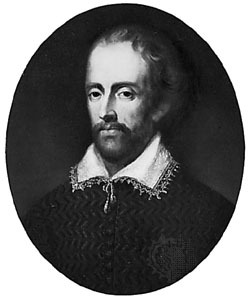 Edmund Spenser, oil painting by an unknown artist; in the collection of Pembroke College, Cambridge, England. April is poetry month! For years I have shared my home and/or my heart with various poets—so I was going to feature some colorful and enigmatic contemporary poetry. Unfortunately none of my (living) poet friends has yet come to my aid with any relevant works. It therefore looks like I am going to have to rely on one of the great canonical poets of classical English literature to celebrate the beautiful discipline of poetry. The lack of title or history is appropriate. The work seems self-explanatory—an allegory concerning the pain of love written in the vein of both Catullus and Chaucer. However just as Roman and Medieval poetry had unsettling edges and disconcerting depths, so to does Spenser’s poem about Cupid and the bee. for many haue err’d in this beauty. or giue lyke leaue vnto the fly. when thou doest spoyle of louers make. to be so bath’d in Venus blis. his mothers heast to proue. 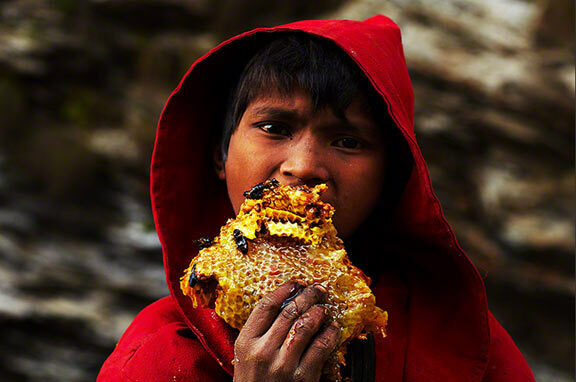 The world’s largest honeybee, the controversial Himalayan cliff honey bee (Apis dorsata laboriosa) lives high in the Himalaya Mountains among the craggy peaks of Bhutan, Yunnan, Nepal, and the Himalayan provinces of India. The large honeybees are renowned for building large nests/hives within the inaccessible overhangs of huge cliffs. These nests tend to be found at altitudes between 2,500 and 3,000 m (8,000 and 10,000 feet) built into cliffs which face to the southwest. Although Himalayan cliff honey bees have complicated lives within a densely layered hierarchical colony, they are not controversial because of their social complexity, but rather because of taxonomical quibbles. Before 1980, Apis dorsata laboriosa was classified as a subspecies of Apis dorsata (the giant honeybee of Soth Asia), but during the eighties and nineties, the Himalayan cliff honey bee was thought to be a unique species (Apis laboriosa). In 1999, the species was demoted back to a subspecies of Apis dorsata (although some genetics-minded entomologists argue that it is a distinct species). Hopefully you followed all of that—it sounds like more vertiginous twists of naming might still lie in the near future. Perhaps some of this confusion comes from how inaccessible the bees are. Only gifted mountaineers and free-climbers could ever hope to reach the lofty hives where the bees deposit their precious honey and larvae. From their towering homes, the bees are able to forage nectar and pollen from upland meadows of the Himalayas (which burst into extravagant fields of flowers during the brief seasons of spring and summer). 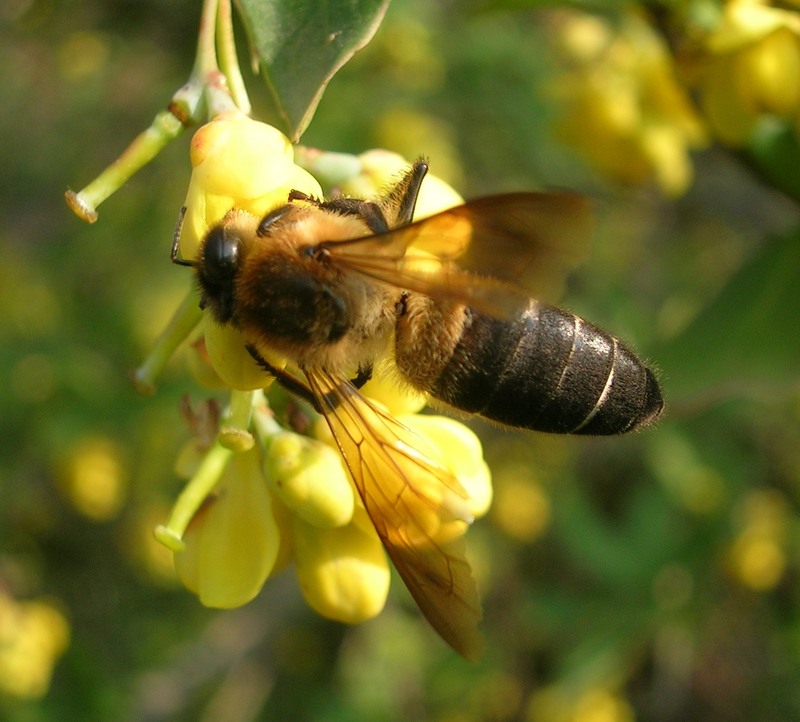 Sadly for the bees, there is a terrible catch—the spring honey which they harvest from the high mountains comes partially from the nectar of white rhododendrons (which contain a grayanotoxin). The spring honey from rhododendrons is red in color and, when fresh, reputedly has a narcotic effect on humans. 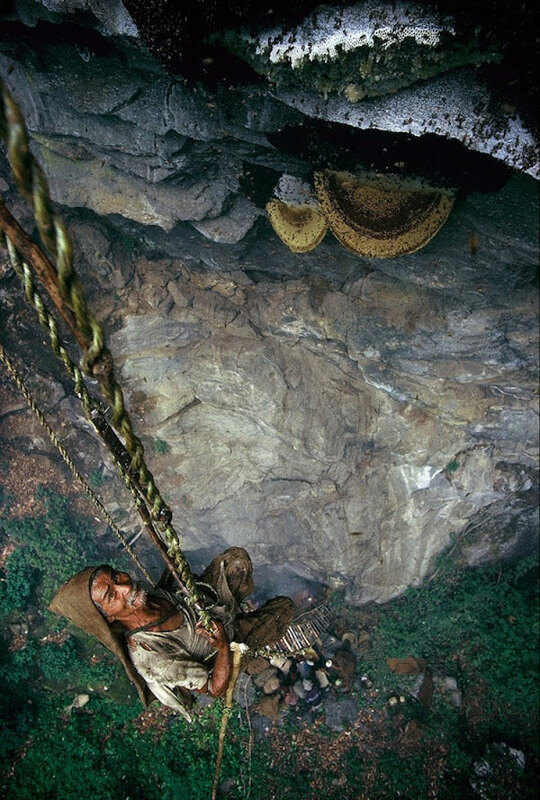 Honey hunters risk life and limb to climb high up the mountains. They then use long poles to rob the bee hives–all while teetering hundreds or thousands of feet above a sheer precipice and being attacked by angry giant bees! The honey fetches a huge premium among the rich of Japan, Singapore, and China even though grayanotoxins are, you know, toxins, and can cause cardiac problems in addition to the soothing intoxicating effects. 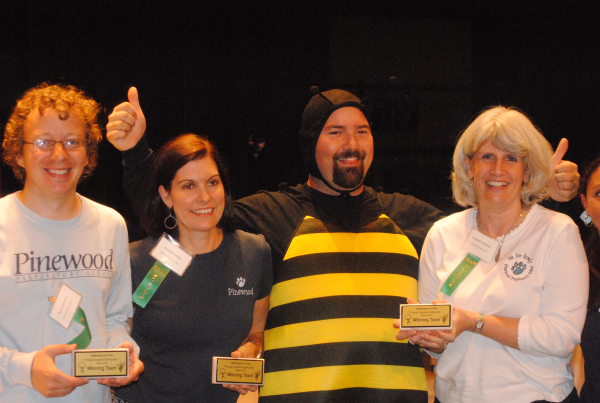 Justin Orvel Schmidt (pictured above) is an entomologist who specializes in insect defenses. His greatest expertise is in the stings of hymenopterans—the bees, wasps, sawflies, hornets, and ants (although he also researches the toxic/chemical defences of other arthropods). 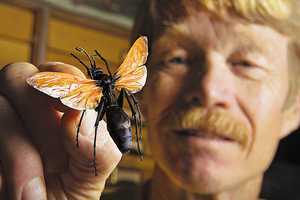 In the early 1980’s Schmidt attempted to systematize the different medical and physiological effects of insect stings. This work led him to coauthor one of the comprehensive tomes on the subject of insect venom Insect Defenses: Adaptive Mechanisms and Strategies of Prey and Predators. Unfortunately for Schmidt, in the course of his researches, he has been stung/bitten innumerable times by various aggressive and toxic insects (and other creepy crawlies) from around the world. 4.0 Pepsis wasp: Blinding, fierce, shockingly electric. A running hair drier has been dropped into your bubble bath. While the work lacks rigorous empirical criteria, even the most relentlessly analytical critics seem to aver that being stung by over 150 different species of arthtopods gives Schmidt a certain robust validity. The literary merit of the metaphors is certainly genuine (although one hopes that the good Doctor Schmidt never actually dropped a hair dryer into his bubble bath or let misanthropic vaudevillians torture him with fire). Personally I have only been stung by sweat bees, honey bees, and yellow jackets, so I cannot testify to the more esoteric sting ratings (thankfully–since yellowjacket stings nearly did me in), however something sounds completely right about the yellowjacket sting description. I recall a moment of warmth which metastasized almost immediately into a sour panic-inducing pain which spread through my arm and then my body. In conclusion, I salute Justin Orvel Schmidt as a man of science and a masochistic poet/performance artist. 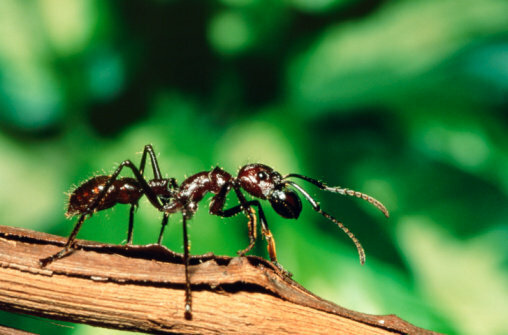 If he claims that a bullet ant sting is the worst hymenopteran sting, I see no cause to contradict him and I never want to think about it again. Here in New York the weather outside is February gray. The buildings are gray. The sky is gray. The trees are gray. The people are dressed in gray and black. Fortunately we can beguile away this monochromatic tedium by contemplating the Euglossini, also known as the orchid bees! Despite their Latin name, the Euglossini are not uniformly eusocial. 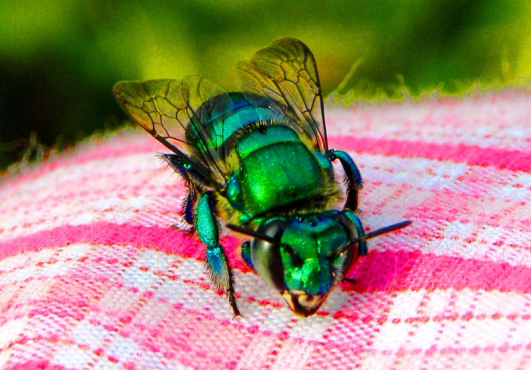 This means that most species of orchid bees live solitary lives (in marked contrast to honeybees–which live in vast hives more ordered than the strictest totalitarian state). 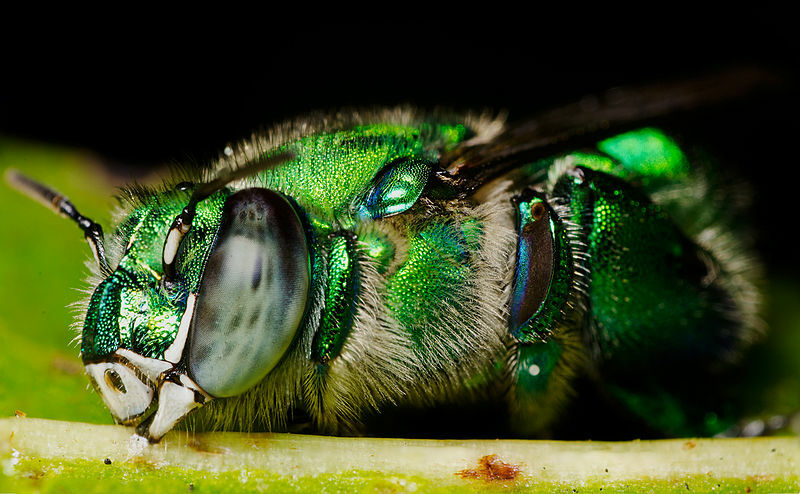 The orchid bees live in Central and South America, apart from one species which ranges into North America. 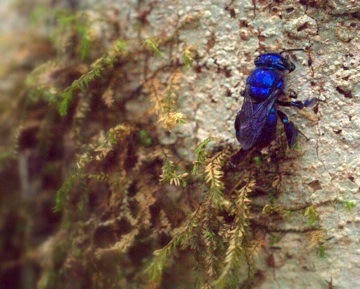 They are notable for their brilliant iridescent blue and green coloring. The females build nests out of mud and resin. The most remarkable aspect of Euglossini behavior is the male bee’s obsession which the aromatic compounds produced by various tropical orchids. 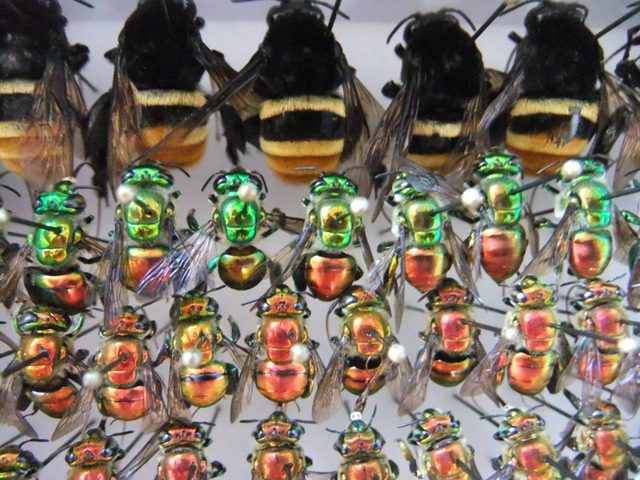 Male orchid bees have a rarified ability to sense these fragrances even in small quantities (like many heady floral/fruit scents the chemicals produced by the orchids are usually complex esters). The bees harvest the molecules with front legs specially modified to resemble little brushes (and in doing so they generally pollinate the orchids, which are wholly dependent on the bees). Astonishingly, the male bees store the chemicals in a cavity on their back leg which is sealed off and protected by waxy hairs. The male bees appear to use these compounds when trying to attract a mate but no female attraction to the odors has been proved. On the other hand, many Stanhopeinae and Catasetinae orchids are absolutely dependent on the male bees to reproduce. Different species of these orchids rely on specific species of orchid bees to successfully pollinate far-away partners in the rainforest. Charles Darwin wrote about this pollination system after observing it in the wild and later referred to the highly specialized orchids as proof of the ways in which species adapt to their environments. 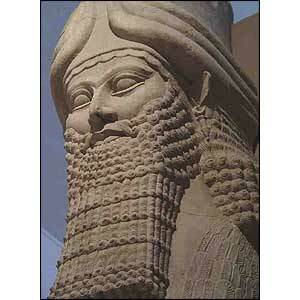 Imagine having a thick luxurious beard which would make an Assyrian king proud. Pretty appealing! OK, now imagine if that heavy beard were composed of tens (or hundreds) of thousands of live bees. Aagh! The loveable little black and yellow creatures are instantly transformed into the stuff of horror! What is wrong with people? With their complex societies, compound eyes, elaborate gendered castes, and preternatural work ethic, bees can sometimes seem quite alien, but nothing the insects do strikes me as so strange as the behavior of the humans involved in the activity of bee bearding. Since the ancient beginnings of apiculture, beekeepers have put bees on their own bodies to demonstrate their command over their “livestock”. 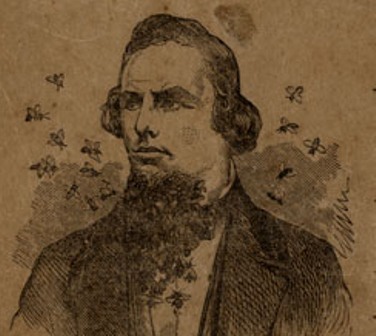 This practice took a dramatic leap forward in the early 19th century when a visionary Ukranian beekeeper named Petro Prokopovych started popularizing some of his innovations by coaxing large numbers of bees to cover his face and neck in large numbers! The practice was subsequently adopted by numerous 19th century carnival folk, showmen, and honey sellers in order to stir up interest and make some money, and it continues to this day. In order to create a bee beard, a beekeeper separates a group of bees from a hive and puts them in a box for two days (making sure to feed them with plenty of sugar water). The beekeeper then puts a tiny cage containing a young queen bee underneath his/her chin, and waits with quiet, calm determination as the carefully released workers follow the queen’s strong pheromones and surround her en mass. In effect the bee-bearder is creating an artificial swarm—a state of affairs when bees abandon their traditional defensive behaviors. It’s kind of like monkeys in a barrel. The original bee holds onto the face and they hold on to each other. It’s kind of little claws, holding on to the skin, If I try to move my face, they hold on with all their might, it feels like a sunburn. The skin is tight. That’s a pretty blasé way to describe wearing a lot of living things—and bee beards can be made up of truly huge numbers. 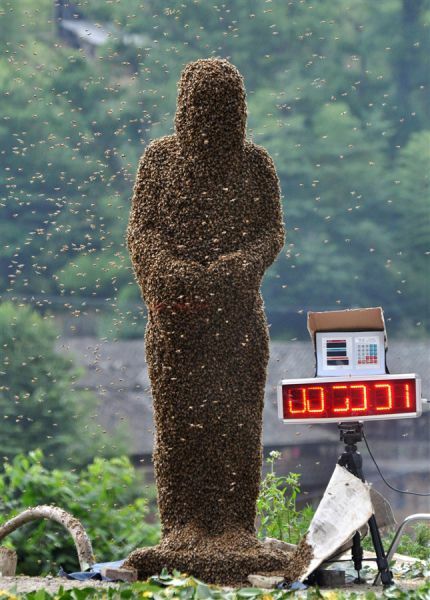 In 1998, the record holder, an American animal trainer named Mark Biancaniello, wore a beard (or maybe a body suit) consisting of 350,000 bees–which together weighed just under 40 kilograms (about 87 pounds). There is a brave Chinese beekeeper somewhere inside there, I swear! As in many other matters, Chinese beekeepers have been pursuing this record. Although the East Asian apiarists have not beat the record yet, they have done a good job coming up with impressive bee beard stunts. In fact, a pair of Chinese beekeepers, Li Wenhua and Yan Hongxia, were wed while wearing matching bee swarms! 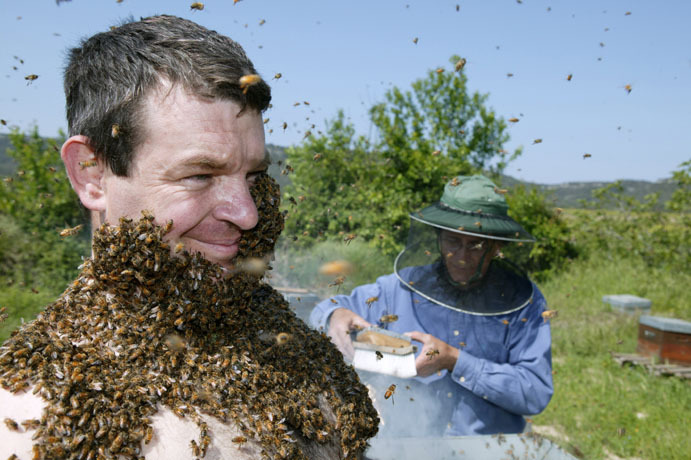 The real trick behind bee beards is safely removing them. Apparently the wearer leaps straight into the air and comes down in a jarring fashion which knocks the bees loose. Then assistants spray the remaining bees with white smoke as the beekeeper removes stragglers with gentle shaking motions. That is what I have read at any rate, I have no intention of trying this myself! The aggressive drive and single minded focus which bees and wasps bring to creating and defending their hives have long drawn the attention of warriors, rulers, and merchants. 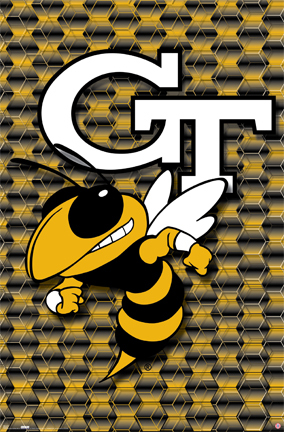 There is a long history of bees as heraldic logos, military insignia, and as corporate logos and or mascots. Additionally, bees and hornets are surprisingly popular in the world of sports. Here is a miniature gallery of bees used as insignias or as mascots throughout the ages. The Barberini were a bloodthirsty Italian aristocratic house from Florence. The Barberini reached the apex of their power in the 17th century when Maffeo Barberini ascended to the throne of Saint Peter as Urban VIII (who was noted for melting down classic bronzes and having the birds in the Vatican garden poisoned). Napoleon was also a fan of industrious bees. 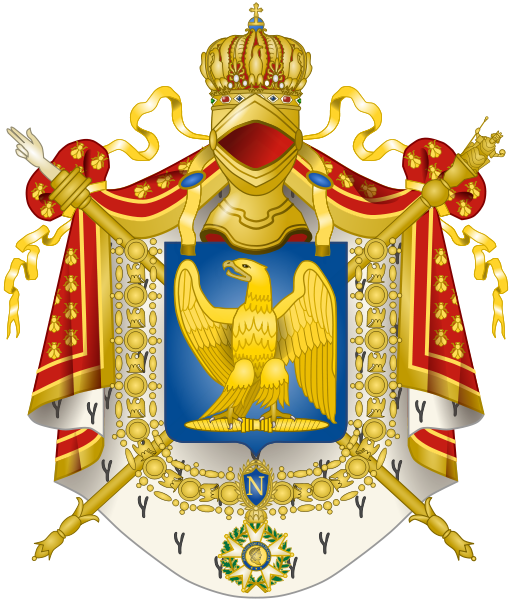 Closely looking at his coat of arms reveals that the red cloak framing the eagle shield is embroidered with bees. 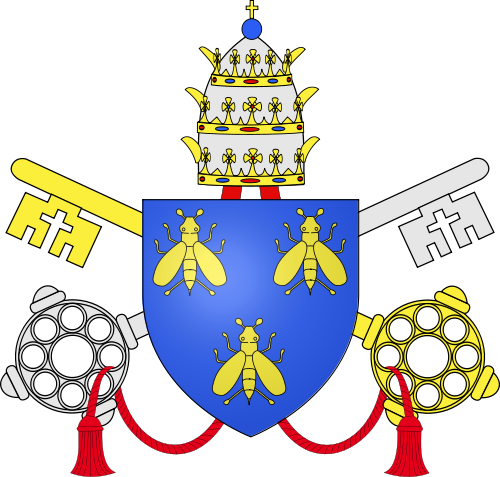 Not only do the bees represent hard work, ferocity, and fecundity, they are meant to allude to the golden bees/cicadas found in the tomb of the Merovingian king Childeric I, who founded the French throne in 457. Bees and hornets are also favored by more contemporary soldiers. 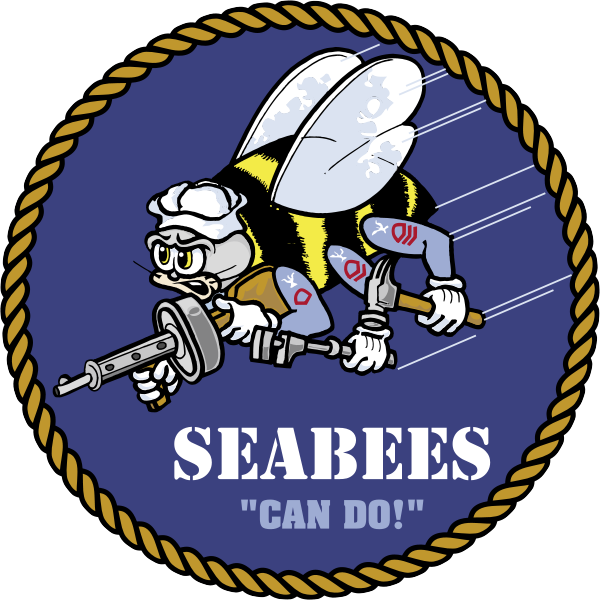 My personal favorite of all bee-themed logos is the Seabees logo which was designed in the war year of 1942 and has remained unchanged since then. The Seabees are the Naval Construction forces, who were (and are) expected to build critical military infrastructure like airstrips and docks even under fire. Their motto is “Construimus, Batuimus” (“We build, We fight!”) and the pugnacious bee on their logo reflects this with his machine gun, wrench, and hammer. 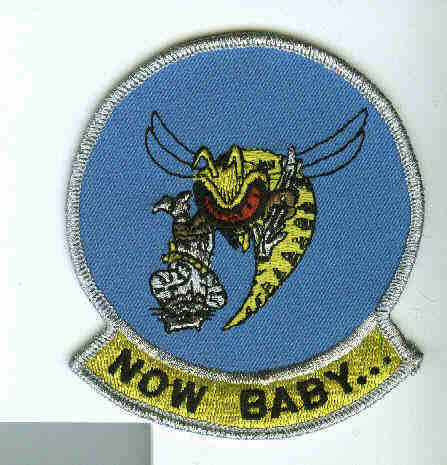 In the US Air Force one of the prominent all-weather, multi-role fighter jets is the F/A-18 Hornet and a number of badges represent the fighting elan of the men and women who fly and service them (like this badge showing a hornet beating up a tomcat). 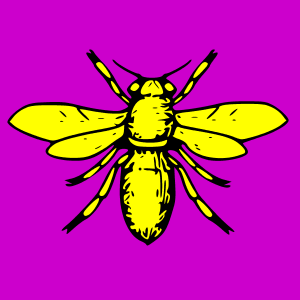 Beyond the manor and the battlefield, there are numerous corporate bees and hornets. 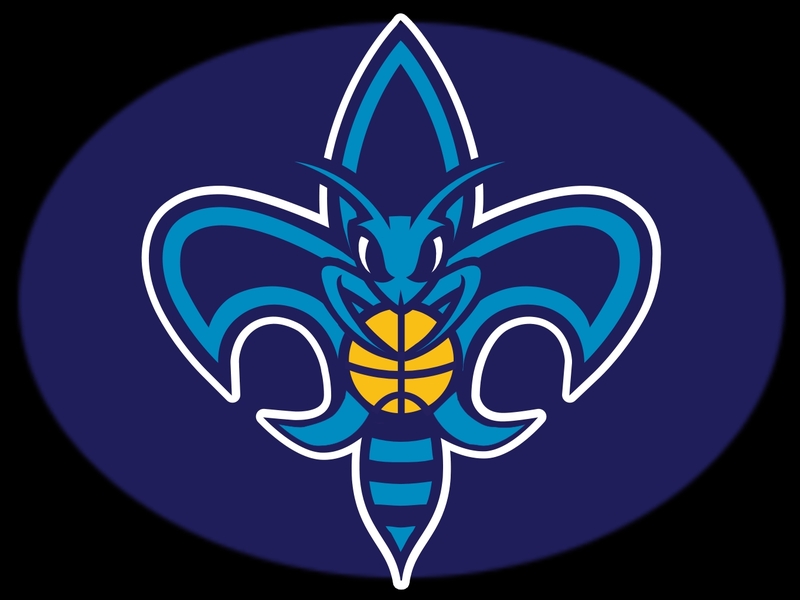 The New Orleans hornets are a professional basketball team. The fierce hornet has been elided with the city’s trademark fleur de lis. The London Wasps apparently play rugby. The honey nut cheerio bee has been hard-selling honey flavored oat cereal for General Mills for long years. 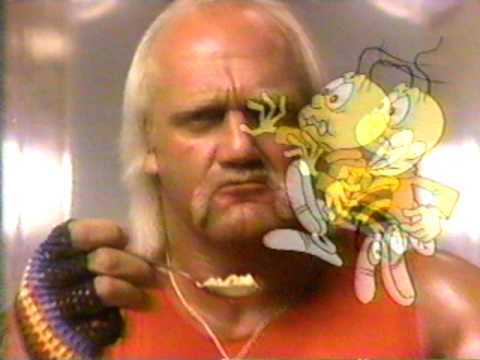 Here the bee is pictured wobbling in space time as he annoys a professional wrestler. The Green hornet is a comic book hero who dresses up like a stinging insect and makes his Asian manservant fight crime. 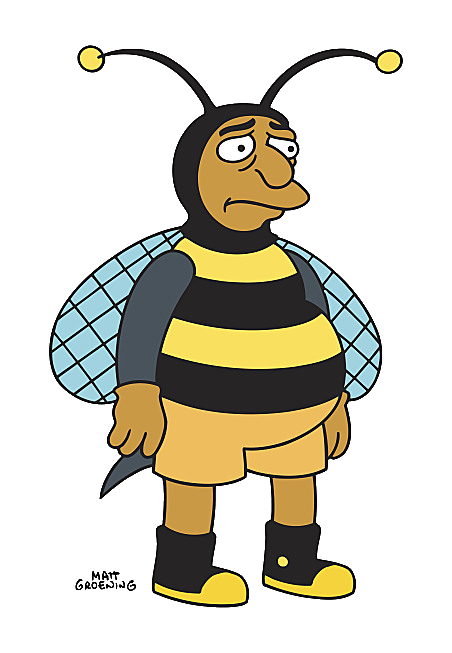 The Bumble Bee man is a long-suffering Mexican-American TV star in the cartoon world of the Simpsons. 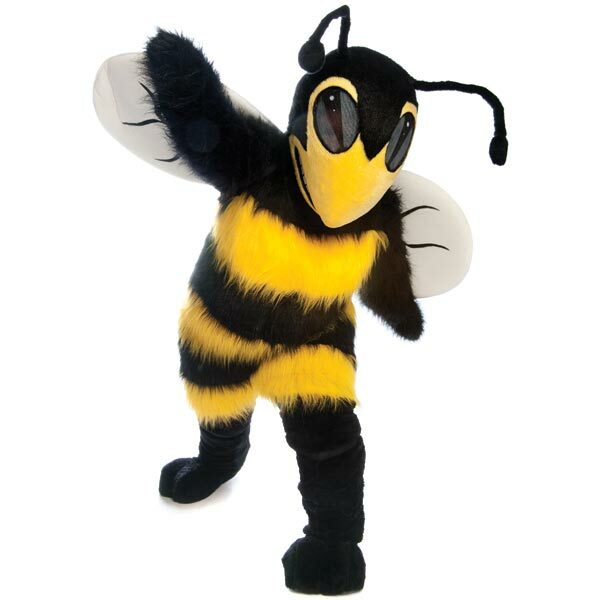 The Bee man finally brings us to real world bee costumes which I think largely speak for themselves.